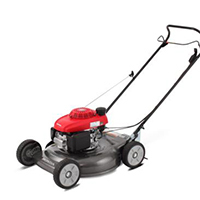 The HRS216 Side Chute Lawnmower is built tough to last in any domestic setting. It features a durable steel 21-inch cutting deck, which is robust enough to handle any hazards you might encounter in your yard. With six cutting heights available, there’s a height setting for every suburban backyard. 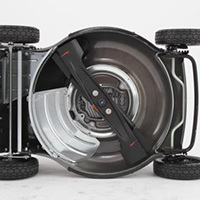 And the HRS216 features ball-bearings in the rear wheels, ensuring you can easily manoeuvre it around your lawn. Honda has a long record of industry leadership in the development and application of advanced safety technology, and the HRS216 is no exception. 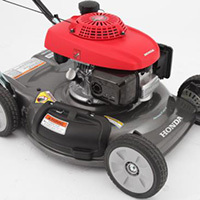 An added safety feature is Honda’s Engine Brake technology, which allows for the engine and the rotating blades in the mower to stop within three seconds of releasing the handle. What makes the HRS216 stand out from the crowd is its distinctive side chute design. It allows your grass clippings to be returned and rejuvenated straight back into the soil. Of course, by returning the nutrient-rich grass clippings into the soil, your yard will remain healthy and happy. This side chute removes the need for you to use a catcher bag.